The Tai Chi for Health program hosted by COTA NT was created by by Dr Paul Lam of the Tai Chi Health Institute. 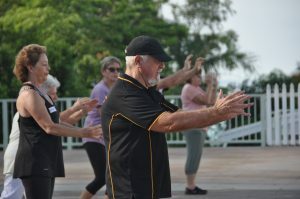 At the age of 65 he completed his Certificate III in Fitness through Charles Darwin University, and developed an appreciation of the importance of remaining active for older Australians. After experiencing Tai Chi as part of his recovery from surgery he became intrigued by the ancient martial art and decided to pursue a career in Tai Chi instruction. After extensive research Bernard discovered the Sun style and saw how perfect it would be for older Australians. He undertook further study at the Tai Chi for Health Institute under Dr Paul Lam, completing Tai Chi for Arthritis and Tai Chi for Arthritis 2 modules. If you have any questions about Tai Chi for Health or Tai Chi for Arthritis, or any of his other classes, you can contact Bernie on 0427 188 314 (please leave a message if he is unable to answer the phone).